The Pets Stop Part Mission Bottom Weave 2-Panel Free Standing Dog Gate is a designer dog gate with a solid bottom and a mission style top. The Pet Gate is available in a 3 colors. These highly versatile 2-Panel, freestanding dog gates are the perfect solution to small dog owners looking to block a wide range of openings. Dog Gate sold in two panel sets, additional panels can be added indefinitely. Picture for demonstration purposes only! 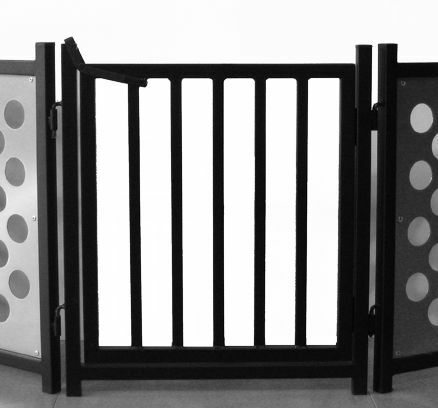 The same configuration can be use with this dog gate as shown to left.